Successful Traits of a BCMHSUS NURSE. As a BCMHSUS nurse, you bring your patient-care expertise to assist in the care for clients dealing with some of the most complex combinations of mental health, substance use and physical health issues. You could work within forensic psychiatric services for people involved with the criminal justice system, or within health care services for inmates incarcerated in provincial correctional facilities. You would perform both physical and mental health assessments, refer, treat, and evaluate clients; as well as document client records. You would work in an innovative and collaborative environment with other health care professionals, clients, and communities. 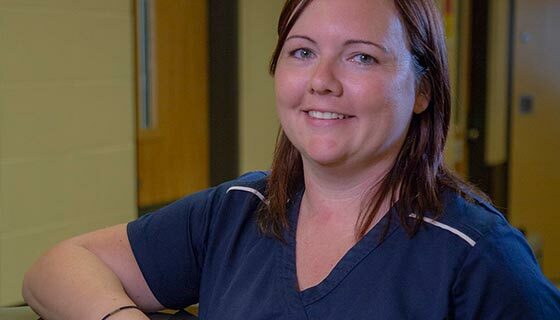 What does it take to be a successful BCMHSUS nurse at PHSA? Check out the top traits we’re looking for and see if you have the right mix. BCMHSUS is a province-wide resource for people who are affected by problematic substance use, mental health issues and health care concerns. The goal is to support people to regain their health, benefit from treatment, and eventually return to community life, with continued support for recovery. The service integrates mental health, substance use and primary care to provide a holistic approach and focuses on a person’s individual strengths. "There are a few reasons I like working at Burnaby Centre: being part of the team and feeling supported and encouraged every day; there's a sense of family with all my colleagues; and we all support each other in a common goal of providing the best care possible to our clients." "There's a real humanity to it. We get to deal with a patient one on one. Whereas with hospital nursing, you're usually dealing with seven to ten patients at a time. So you really get to know the clients and what some of their issues are, and you start to build a rapport and build trust and that can happen over time. Then you do see them out in the community, and they're successful. That's always a good feeling." "I work with my best friends every day; we're very close due to the acuity of the environment—we operate according to team principles. We provide team nursing here, which is a little bit different that other more traditional nursing environments. It's pretty rewarding." PHSA together with BC Mental Health and Substance Use Services (BCMHSUS) took on responsibility for the delivery of health care services in BC Corrections facilities in October 2017. PHSA is mandated to improve the quality and continuity of care for clients across the province during their time in correctional facilities and as they reintegrate into the community. This will help to improve access to primary health care, as well as mental health and substance use supports for inmates, key needs that have been identified not just in BC, but internationally. The Clinic Nurse provides trauma informed nursing care to clients with physical or mental health needs and/or concurrent psychiatric and/or substance abuse/misuse disorders. Provides direct health care services to clients presenting with a wide variety and complexity of acute and chronic illnesses/diseases, including communicable diseases, substance dependency, and mental health and general health issues. Performs physical, substance use and psychiatric assessments, refers clients to the physician for further examination, and administers prescribed treatments and medications. Observes, monitors, evaluates, and documents client progress, symptoms, and behavioral changes and performs a variety of health care interventions. Provides education and support to clients/groups using a health promotion approach. Works collaboratively with the interdisciplinary team, other health care professionals, clients, families, and the community. Performs job duties through a Trauma Informed Care Framework and Indigenous Cultural lens. Provides direct trauma informed health care services to clients presenting with a wide variety and complexity of illnesses/diseases including communicable diseases, substance dependency, mental health, and general health issues. Performs physical, substance use and psychiatric assessments, collects specimens, refers clients to the physician for further examination, administers prescribed treatments and medications according to protocols and makes appropriate adjustments. Triages Health Service Requests from clients and makes appropriate treatment plan or referrals. Observes, monitors, evaluates, and documents client progress, symptoms, and behavioral changes and performs a variety of health care interventions utilizing nursing skills and medical equipment including therapeutic interventions using a variety of modalities. Initiates and facilitates discharge planning in collaboration with the interprofessional treatment team; identifies referrals to other health professionals. Provides education and support to clients and groups using a health promotion approach regarding matters such as contraception, birth control, sexually transmitted diseases, upper respiratory tract infections, urinary tract infections, and minor dermatology problems. Works collaboratively with other health care professionals, client, family, and community in the identification and resolution of health issues, cultural and language barriers, ethical dilemmas and coordination and integration of care, and makes referrals to other service providers as appropriate. Current practicing registration as a Registered Psychiatric Nurse with the College of Registered Psychiatric Nurses of British Columbia (CRPNBC) or as a Registered Nurse with the British Columbia College of Nursing Professionals (BCNP). Two (2) years’ recent experience providing trauma informed acute or community health nursing care/services to patients who have a combination of physical, psychiatric and/or concurrent substance abuse/misuse disorders or an equivalent combination of education, training, and experience. Occupational First Aid Level 2 certification (OFA Level 3 certification for positions at the Ford Mountain Correctional Centre). Working knowledge of community health nursing theory including mental health and addictions, communicable diseases, and practice within a patient/family-centered approach. Working knowledge of CRNBC's Standards for Nursing Practice. Knowledge of the BC Mental Health Act, other facilities and community resources. Demonstrated case management, teaching/training, clinical support, and consultation skills. Demonstrated ability to communicate effectively, both verbally and in writing. Demonstrated skill in CPR techniques. Ability to carry out the physical demands of the job. Skilled in the use of equipment, and in the techniques appropriate for treatment. Basic computer literacy to operate a computerized patient care information system and word processing, spreadsheet, Internet and e-mail software. We invite you to apply by clicking on the "Apply Online Now" button where you can register for the first time or enter your Username and Password in order to re-access your profile on our system.